With reasonable care, pearl jewelry can be a lasting treasure. 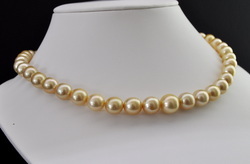 - For routine care, it’s best to wipe pearls with a very soft, clean cloth after each wearing. 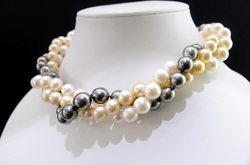 - Pearls should never be cleaned in an ultrasonic or steam cleaner. It’s safe to use warm, soapy water for occasional, through cleaning (assuming that the nacre is in good condition). If the pearls are strung, be sure the silk is completely dry before wearing. - Store pearls separately from gems and metal jewelry, which may scratch their surfaces. - Never store pearls in a plastic bag. Plastic can emit a chemical that will damage the surface of pearls. The same is true of cotton wool. - Never store pearls in safe deposit box for a long time. Like your skin, pearls need a little moisture so that they will not dry out. - Pearls can be damaged by many chemicals and all acids. The list includes hair spray, perfume, cosmetics and even perspiration. - Always apply perfume, hair products and cosmetics before putting on your pearl jewelry. Remember: when dressing, pearls should be the last thing you put on and the first thing you take off. Human invention may occur or continue after harvest in an effort to improve a pearl’s color, shape, surface appearance, weight, and durability. Processes may include bleaching, heating, dyeing, irradiation, and coating to enhance color, pealing to improve shape and/or surface appearance: or filling and impregnation to increase weight or enhance durability. Freshwater pearls are different from saltwater pearls. Freshwater pearls are cultured in mussels, while saltwater pearls grow in oysters. Akoya pearls. Akoya pearls, named after the Akoya oyster in Japan which they are grown in, are the epitome of the classic pearl. Akoya pearls are milky white or rose in color, with silver or gold overtones. However, they are also available in cream, minty green, and light blue. Akoya pearls range in size from 3mm to 10mm, and exist in the classic round shape. South Sea black pearls. South Sea black pearls are grown in black-lipped oysters off the coast of Tahiti. Pearls from this region are renowned for their rich black hue and large size. South Sea pearls start at 8mm, and get even larger. The most sought-after color of this type of pearl is black with a peacock green undertone. These pearls are also available in rich navy blue, silver and slate, deep plum, and dark green, and may have overtones of pink and blue. South Sea white pearls. Grown in the silver-lipped oyster, South Sea white pearls are found off the shores of Australia, Indonesia, Burma and Okinawa. Similar to black pearls grown in the region, South Sea white pearls are large and have a high luster. These aren’t harvested until they are at least 9mm, making them more expensive than small white Akoya pearls. They are found primarily in creamy white and silver hues, but they may have a rose overtone. South Sea gold pearls. The rarest of all pearl varieties is the South Sea gold pearl. These are only grown in gold lipped oysters near the waters of Australia, Philippines or Myanmar . These pearls are large – starting at 9mm – and valued for their unique color. These range in hues from light champagne to bright gold, the latter being more sought after. The gold-lipped oyster also produces white and cream pearls, but these look similar to those made by the silver-lipped oyster. Cortez pearls. Cortez pearls are a rare variety, grown in rainbow-lipped oysters off the coast of the Sea of Cortez in Mexico. 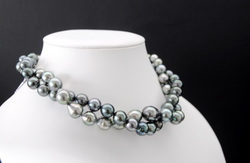 They are classified as black pearls, but also come in a variety of colors. The most beautiful of the Cortez pearls (and most iconic) is dark pistachio green with bright rainbow overtones (primarily rose and gold). These pearls begin at 8mm, growing to 12 mm in size. Conch pearls. Conch pearls (pronounced ‘Konk’) are not traditional pearls, as they are non-nacreal (the saliva-like liquid in oysters) and are formed inside a conch shell. Conches are large mollusks in a spiral shell, found in the Caribbean and South Pacific Seas. Conch pearls are incredibly unique in appearance. They are found in bright pink and peach shades, with a flame-like pattern on the exterior. The flame, similar to that seen in an opal, determines the value of the pearl. They come in various sizes and shapes, but few are round.